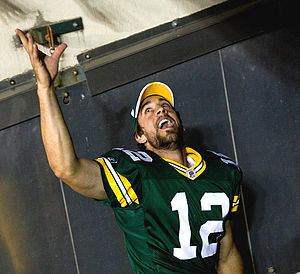 10 – Green Bay Packers – The Packers cleaned up yet again with a dominating Monday-night win over the Vikings. Green Bay is cruising right now, and their Thanksgiving Day trip to Detroit looks better and better every day. 9 – New Orleans Saints (UP A LEVEL), Pittsburgh Steelers, San Francisco 49ers (UP A LEVEL) – The Saints got a hard-fought road win in Atlanta to take control of the NFC South. They head into their bye with a 7-3 record and with momentum. The Steelers went to Cincinnati and got a seven-point win that keeps them in the AFC South hunt. They too are 7-3 entering the bye. The 49ers beat a good Giants team 27-20 to move to 8-1, and they should be thinking about what it will take to lock up not just the NFC West but a first-round playoff bye as they enter the NFC West-heavy portion of their schedule. 8 – Atlanta Falcons, Baltimore Ravens (DOWN A LEVEL), Chicago Bears (UP A LEVEL) Houston Texans (DOWN A LEVEL), New England Patriots, New York Giants – We explained why the Giants stay here and why the Bears are now at this level in Rise/Sink/Float. The Falcons lost at home to the Saints, thanks in part to a controversial fourth-down call in overtime. They need to rebound against the Titans this week.The Ravens suffered a let-down in a 22-17 loss in Seattle, giving up their AFC North advantage in the process. They can bounce back with a home game against the Bengals this week. The Texans won to move to 7-3 entering their bye, but they lost QB Matt Schaub for the season. The Patriots bounced back from two straight losses by thumping the Jets, and they have a chance to build momentum at home on Monday night against the Chiefs. Despite their recent struggles, New England still is the team to beat in the AFC East. 7 – Cincinnati Bengals, Dallas Cowboys (UP A LEVEL), Detroit Lions, New York Jets – The Bengals and Jets both lost key divisional games that hurt their playoff chances. Cincinnati can’t lick its wounds because it must go to Baltimore this week; the Jets face a quick turnaround in a Thursday-night trip to Denver. The Cowboys blasted the Bills to take a step up among NFC playoff contenders. They can confirm that status in Washington this week. The Lions got killed in Chicago, although that game got out of hand because of special-teams and defensive return touchdowns by the Bears. Detroit can get well against Carolina at home heading into their Thanksgiving Day special against the Packers. 6 – Oakland Raiders, San Diego Chargers (DOWN A LEVEL) – The Raiders beat the Chargers in San Diego to throw the AFC West into complete chaos. Both teams have road games this week, but Oakland’s journey to Minnesota is far more favorable than San Diego’s trip to Chicago. 5 – Buffalo Bills (DOWN A LEVEL), Philadelphia Eagles (DOWN A LEVEL), Tampa Bay Buccaneers (DOWN A LEVEL), Tennessee Titans (UP A LEVEL) – We covered the Eagles’ decline in Rise/Sink/Float. We discussed the Titans in this game review; now Tennessee has a shot in the AFC South because of Matt Schaub’s injury. The Bills lost 44-7 in Dallas and seem to be falling apart before our eyes. So are the Buccaneers, who lost big to Houston at home and must now go to Green Bay. 4 -Denver Broncos (UP A LEVEL), Seattle Seahawks (UP A LEVEL) – The Broncos have figured out a style that lets Tim Tebow succeed, and they are in the AFC West race because of it. A Thursday-night home game against the Jets is an opportunity for another win, given the scheduling situation. The Seahawks haven’t always played well, but they beat the Ravens as well as the Giants this year, which is pretty impressive. Now the question is whether they can find consistency of that kind of effort. 3 – Arizona Cardinals (UP A LEVEL), Jacksonville Jaguars, Kansas City Chiefs (DOWN A LEVEL), Miami Dolphins (UP A LEVEL), Minnesota Vikings, St. Louis Rams (UP A LEVEL) – The Cardinals, who nearly won at Baltimore a few weeks back, got a road win in Philadelphia. The Jaguars beat the Colts as they should have. The Chiefs lost to the Broncos and even worse lost QB Matt Cassel for the rest of the season. The Dolphins got their second straight win by beating the Redskins. The Rams beat the Browns in an ugly 13-12 game. The Vikings got blasted by the Packers on Monday night, which was pretty much expected. 2 – Carolina Panthers (DOWN A LEVEL), Cleveland Browns, Washington Redskins – We covered the Panthers in this game review. The Browns lost at home to the Rams thanks to a special-teams gaffe, but the real problem in Cleveland is an offense completely devoid of playmakers. The Redskins have the same problem, and like the Browns they look horrible despite three early-season wins. 1 – Indianapolis Colts – The Colts lost handily to the Jacksonville Jaguars and will struggle to find a win this season. How Lucky. Mike Vrabel heeded the call of his alma mater, retiring after a 14-year NFL career to become the linebackers coach at Ohio State. (Excuse me – THE Ohio State University.) Below are some thoughts on Vrabel’s decision and his career; we compare his legacy to other NFLers who have retired this offseason in this post. Vrabel was the ultimate Bill Belichick player. After four seasons in Pittsburgh in which he was primarily a backup, Vrabel was one of the 19 unrestricted free agents whom Belichick signed for the Patriots after his first season, and thus he became a part of the team-first group that upset the Rams and won the Super Bowl. Vrabel became a mainstay for the Pats, starting at outside linebacker for eight seasons and providing solid play against the run, the pass, and as a rusher. His versatility didn’t just apply to defense; he also played a little tight end in goal-line situations, recording 10 TD catches over the course of his career. When Scott Pioli left the Patriots to become the GM in Kansas City, he got Vrabel as part of the Matt Cassel trade, and Vrabel started for two more seasons as part of the Chiefs’ recent renaissance. Vrabel fit the Belichick wish list to a tee – versatile, team-oriented, good but not overly talented, smart, and productive. Now he goes back to his alma mater to help the Buckeyes try to recover from the Jim Tressel mess. Vrabel left a bit of meat on the bone with his playing career, but if he takes to coaching he could become even more of a star in that arena than he was on the playing field.